Welcome to Hotique's selection of Boutique Hotels in Mallorca (Majorca) including Design hotels, rural hotels, agroturismo hotels, finca's and luxury hotels in Mallorca. Pick your perfect hotel from our hand-picked selection of the best luxury hotels in Mallorca. Mallorca is full of luxury hotels that are individually styled and full of character. From Palacio Ca Sa Galesa in Palma, quiet rural agroturismo hotels in the North of Mallorca to the exclusive La Residencia in Deia, choose your very own boutique hotel in Mallorca that suits your style. A 19th century building, in the small village of Soller with a breathtaking mountainous backdrop. It provides a classic luxury setting with facilities including a roof top swimming pool, spa, garden and roof top restaurant. Rates from Euros 170 - 680 per night. Based in the pretty village of Deià, La Residencia comprises of two restored manor houses from the 16th and 17th centuries. Beautiful rooms, an award winning Spa, with Sauna, Steam room and Jacuzzi, La Residencia is a rural romantic haven. A stunning setting overlooking Deià and the surrounding countryside. Rates from Euros 400 - 745 per night. Located in the heart of the historic centre of Palma - Convent de la Missio, is a converted modern boutique hotel with 14 rooms. Surrounded by narrow streets, the hotel houses the well known “Refectori” restaurant, roof top solarium patio, whirl pool, and secure large garage for convenient parking in the centre of the old town. 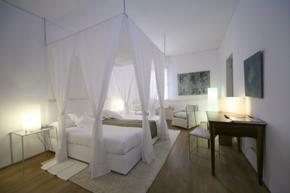 Ideal if you want a modern style boutique hotel in the heart of Palma. Located in the heart of the historic centre of Palma - Palacio Ca Sa Galesa has 12 rooms (7 suites and 5 doubles) decorated in traditional style with antique furniture and original artworks throughout the hotel. Ideal if you want a historic hotel in the heart of Palma. A small country house hotel offering 7 rooms (4 suites and 3 doubles) set in the small hamlet of Binibona. Peaceful rural setting - perfect spot to relax or explore Mallorca's unspoit countryside. Rates from Euros 150 - 280 per night. View Hotique's selection of Boutique Hotels and hip hotels in Majorca - including Hotels in Deia, Palma, Soller and the North West of Majorca. Pick the hip hotel that suits your style. The new Tramuntana Suites at La Residencia with plunge pool and private terrace. The perfect spot for romance.